French Prime Minister Edouard Philippe is vowing to “severely punish” the radicals responsible for rioting and setting fires around one of France’s richest neighbourhoods. Philippe visited the Champs-Elysees on Saturday to show his support for riot police and firefighters struggling to get the unrest under control after it broke out amid yellow vest protests. He estimated up to a few thousand troublemakers were responsible for Saturday’s “unacceptable” violence. Speaking to reporters, he praised firefighters who saved people trapped in a building set fire by protesters. The situation remains tense Saturday along the Champs-Elysees after hours of violence and clashes with police firing tear gas and water cannon. Armoured vehicles and about 15 police vans are lined up at one spot, facing down a mixture of yellow-vested protesters and black-clad people who seemed to be seeking opportunities to target police. Paris police say more than 100 people have been arrested amid rioting in the French capital by yellow vest protesters. 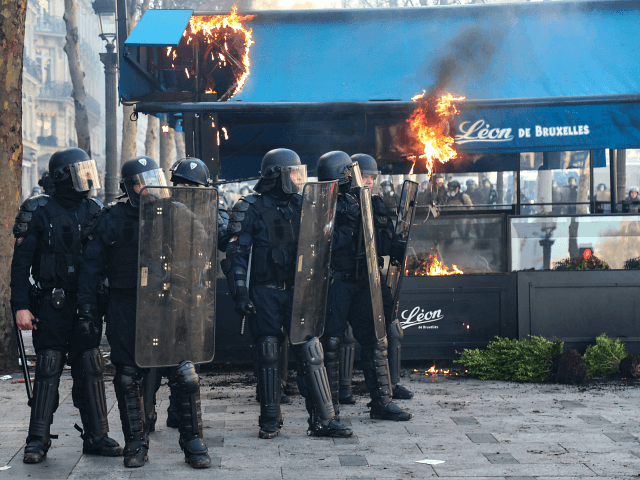 The violence started minutes after yellow vest protesters started gathering Saturday morning around the Arc de Triomphe. They set life-threatening fires, smashed up luxury stores and clashed with police firing tear gas and water cannon. Interior Minister Christophe Castaner said on French television that an estimated 10,000 protesters were taking in protests in Paris and another 4,500 were demonstrating around France. That was up from about 3,000 protesters in Paris last weekend. But the yellow vest numbers paled beside the 30,000 people taking part in a climate march weaving through Paris at the same time, according to Castaner. A bank has been set ablaze as French yellow vest protesters clash with police in Paris and firefighters had to rescue a mother and her child as the fire threatened to engulf their floor. Florian Lointier, spokesman for Paris’ firefighters, told The Associated Press that 11 people sustained light injuries Saturday in the blaze, including two firefighters. The fire in the bank, which was on the ground floor of a seven-story residential building near the Champs-Elysees Avenue, was later extinguished. Lointier said a mother and her child were saved from the flames on the second floor and other residents were safely evacuated. French yellow vest protesters are rioting in the 18th straight weekend of demonstrations against President Emmanuel Macron. Large plumes of smoke are rising above Paris’ landmark Champs-Elysees avenue as French yellow vest protesters set life-threatening fires, smashed up luxury stores and clashed with police in the 18th straight weekend of demonstrations against President Emmanuel Macron. Police tried to contain the demonstrators Saturday with tear gas and water cannons. Fire trucks rushed and extinguished two burning newspaper kiosks that had been set ablaze. Several protesters posed for a photo in front of a kiosk’s charred remains. The violence started when protesters threw smoke bombs and other objects at officers along the famed avenue in the French capital. The violence comes after a two-month national debate that Macron organized to respond to protesters’ concerns about sinking living standards, high unemployment, stagnant wages and general income inequality.